Music Academy Registration for Term 3 is now open! Music Academy Online Registration for Term 3 2017-18 is now open! 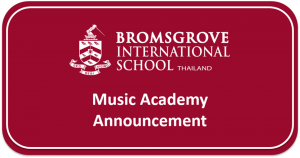 All tuition and registration details can be found on our website at http://www.bromsgrove.ac.th/music. The deadline for registration is 17:00 on Friday 30 March 2018.